mission to mars | Welcome To The Sweet-N-Saucy Blog! With our Mission to Mars event quickly approaching, we’ve got Mars and basically everything about space on our minds! We thought it would be fun to share some facts about Mars you probably never knew before. Be sure to let us know your thoughts in the comments! 10. Mars is two-faced – the northern hemisphere and the southern hemisphere of Mars look completely different from each other. In fact, if you saw them in person, you would probably think they were two separate planets! 9. Mars is a cold…desert! – Who says a desert can’t be cold? It snows on Mars, just like it does on Earth. However, the snow vaporizes before it hits the ground because it’s just so chilly. 8. Mars is rusty – You’ve probably seen plenty of pictures of Mars that make it look rusty. That’s because it is! The surface of the planet contains minerals that are rich in iron, and they rust, making the planet have a reddish color. 7. 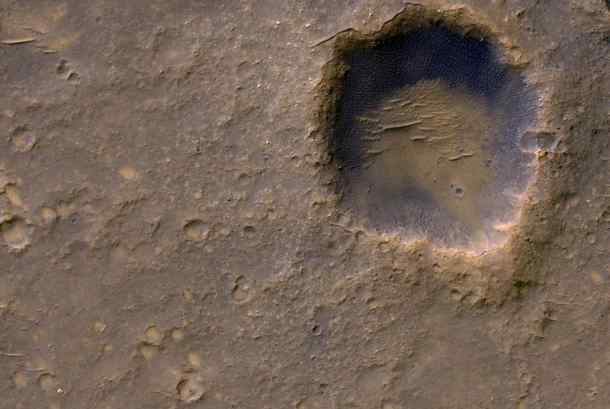 Mars is covered in craters – – Scientists believe that many of the craters that cover Mars were formed when the Universe was still being formed. One crater covers more than 40% of the planet’s face. 6. You have to wear protective gear on the surface of Mars – However, it’s not for the reason you probably think. The low pressure in the atmosphere can actually boil liquid. That means it can make your blood bubble! 5. Mars has water – However it’s not the same water you drink from a glass on a hot day. Ice has even been found at Mars’ north pole. 4. Mars once had rivers and other bodies of water – Mars might be more similar to Earth than we once thought. A look at the planet’s surface reveals evidence of rivers, lakes and other bodies of water. 3. On Mars, it snows…carbon dioxide – It’s easy for you to understand snow on another planet, but what if that snow is made of…carbon dioxide? If you were to see it, you might think it was just fog, but since most of the particles in the atmosphere are carbon dioxide on Mars, what else could the snow be made of? 2. A trip to Mars is a great way to lose weight – – Mars has much less gravitational pull than Earth does. In fact, it’s 37% less. That means you will instantly lose 37% of your body weight. You can jump higher too! 1. No human has ever been to Mars – – We send plenty of machines and robots to Mars to gather data, but no human has ever been there. Are you interested in going to Mars? We can help you get an idea of what it’s like at our Mission to Mars event on October 10, 2014. Contact us, or click here to make your reservations for our Gala event!